Dual Alarm Clock with Wireless Alarm Monitoring Receiver for home or office, that allows notifications to be received for a variety of everyday alerts. Wireless alerting system for home or office, that allows notifications to be received for a variety of everyday alerts. 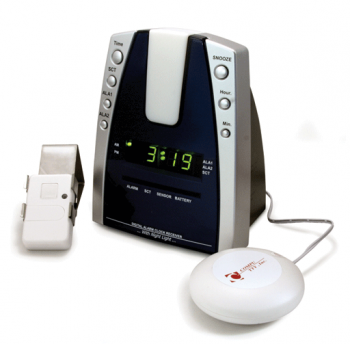 The KA1000 base unit has a built-in clock, lamp outlet, telephone jack, bed shaker and the ability to connect additional wireless transmitters. 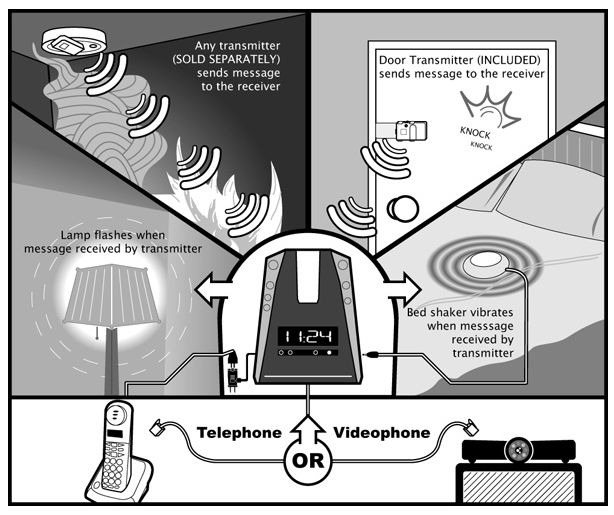 The wireless transmitters can be used to connect fire or smoke alarms, home security systems, videophones and a variety of other audible alarms. The KA1000 base unit functions as an alarm clock and a receiver for the KA300 and KA1000 wireless transmitter. Expand the alerting system to other rooms in the home or office using our KA1000RR, Remote Receivers.